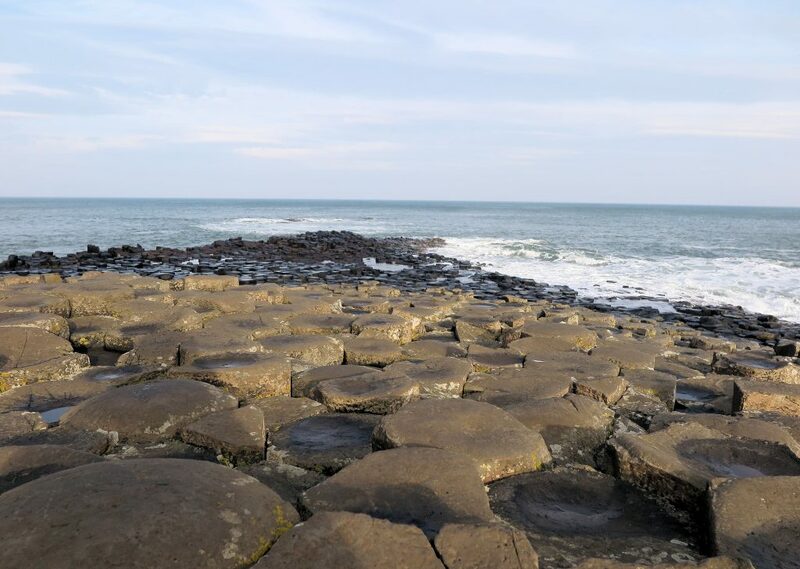 When researching things to do in Northern Ireland with kids, we quickly realised that we would not be able to see and do everything in one trip. So we decided to focus on things to do in Antrim. We were not disappointed with our decision! Whitepark Beach, County Antrim. No filter was used! 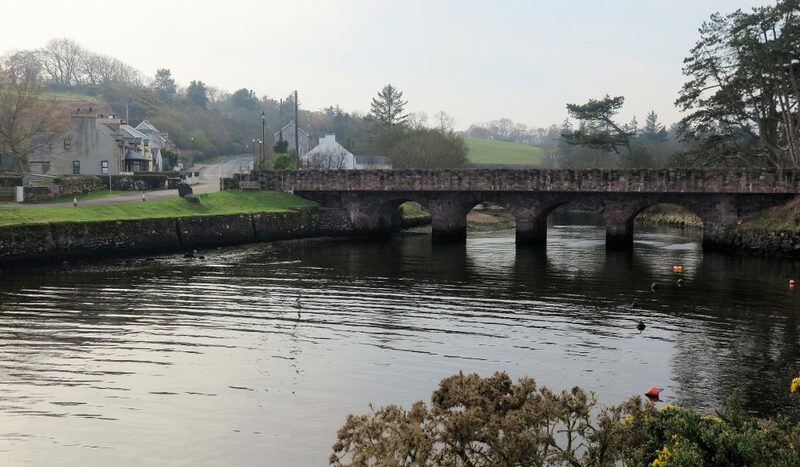 Beautiful, diverse Antrim offers families easy access to history, culture and nature through its ancient sites, windswept pristine beaches and its wide open glens. You will be spoilt for choice! 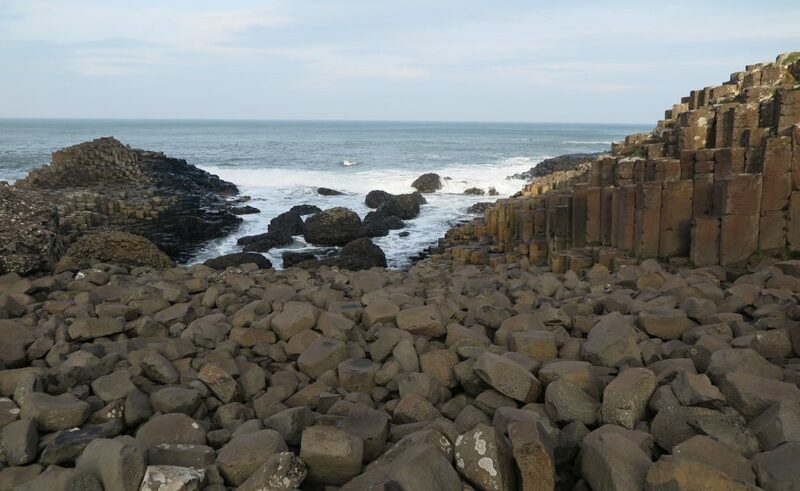 The Giants Causeway is one of Northern Irelands most iconic and most visited sites. It is somewhere I have always wanted to visit and it lived up to all my expectations. Where is the Giants Causeway? The Giants Causeway is a small stretch of rocky coastline on Antrims’ northern coast, around a ten minute drive from the town of Bushmills. 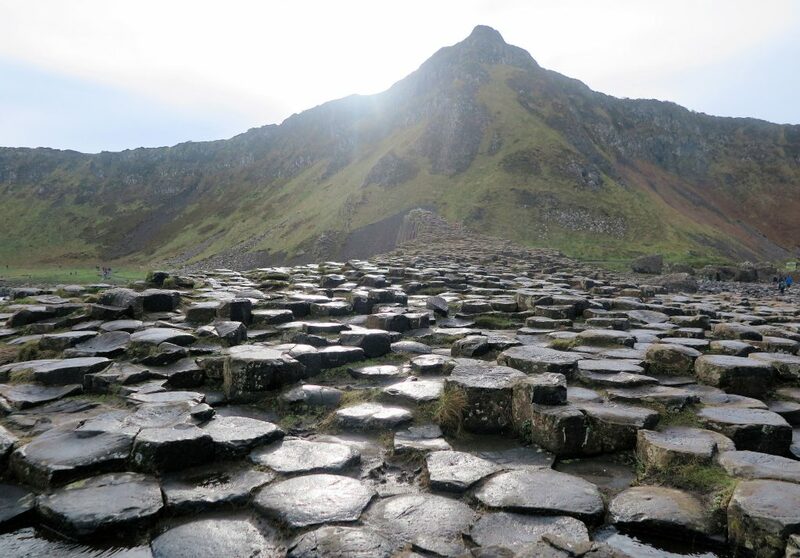 The Giants Causeway can easily be visited independently by car as well as part of a tour. Tours run daily from Belfast and from Dublin. 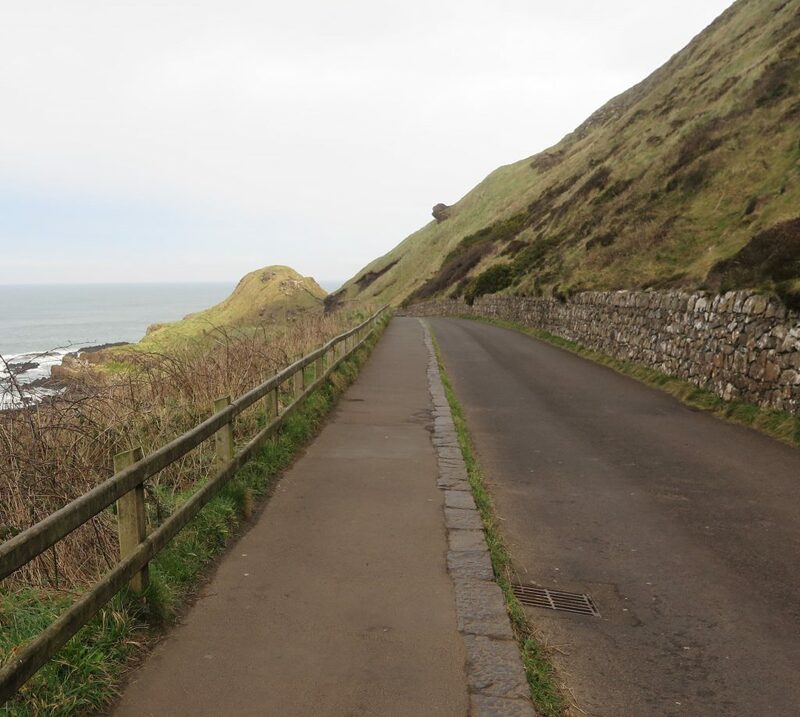 There is no road parking permitted near the Giants Causeway. The local council understandably decided to ban road parking due to increasing congestion in the area and dangerously parked cars. You can park your car at the on site car park for a fee or alternatively park in the nearby town of Bushmills and walk the two miles to the Causeway. In Spring and Summer months there is a Park and Ride operating from Bushmills to the Causeway. 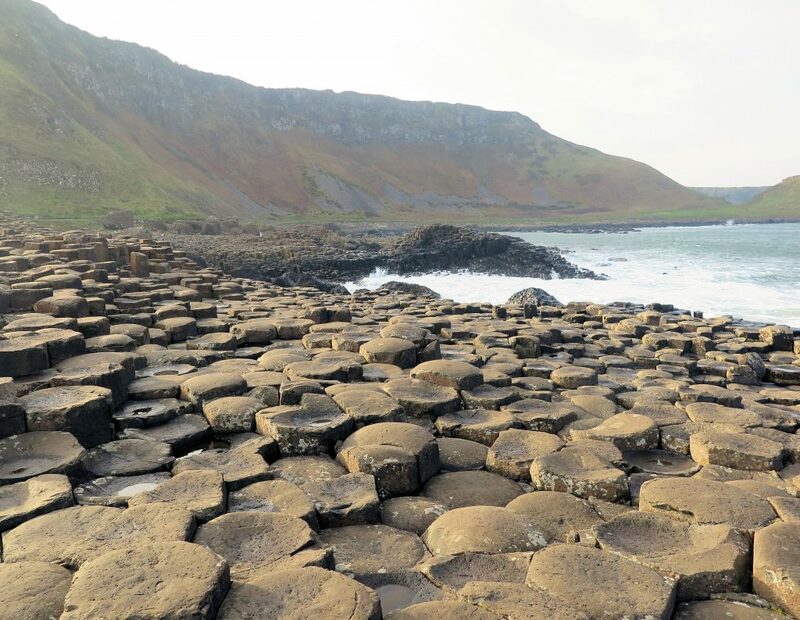 Once you have arrived at the Causeway, you can choose to visit the famous rocks via the Giants Causeway Visitors Centre or by bypassing the Visitors Centre completely. 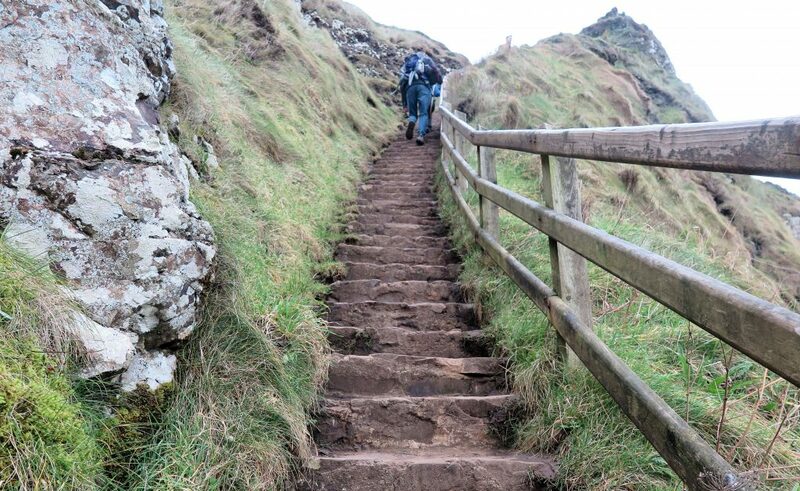 There are two principal paths to access the Causeway and both can be accessed without paying the entrance fee to the Giants Causeway Visitors Centre. The buggy friendly Blue Trail starts to the left of the Visitors Centre after descending a short set of steps. Choose between walking to the Causeway on a smooth, tarmacked downhill path beside the narrow private road used by the shuttle buses or catch the shuttle bus itself. You can still use the bus even if you do not visit the Visitors Centre. A one way ride is £2 per adult and £1 for children. 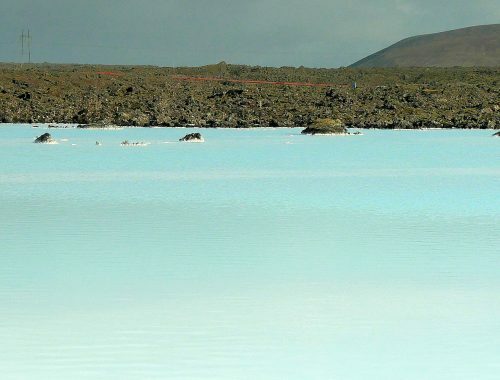 However, the Blue Trail is very easy to walk and only takes around ten minutes to reach the Causeway. A popular choice for families is to walk down to the Causeway and then catch the bus back. Alternatively, the Red Trail begins to the right of the Visitors Centre and runs along the top of the unfenced cliff. The unpaved trail descends to the Causeway via a set of steep steps. The Red Trail then divides into two. Turn right and follow the uneven, steeply rising path around the headland, passing ‘The Organ Pipes’ on the way. 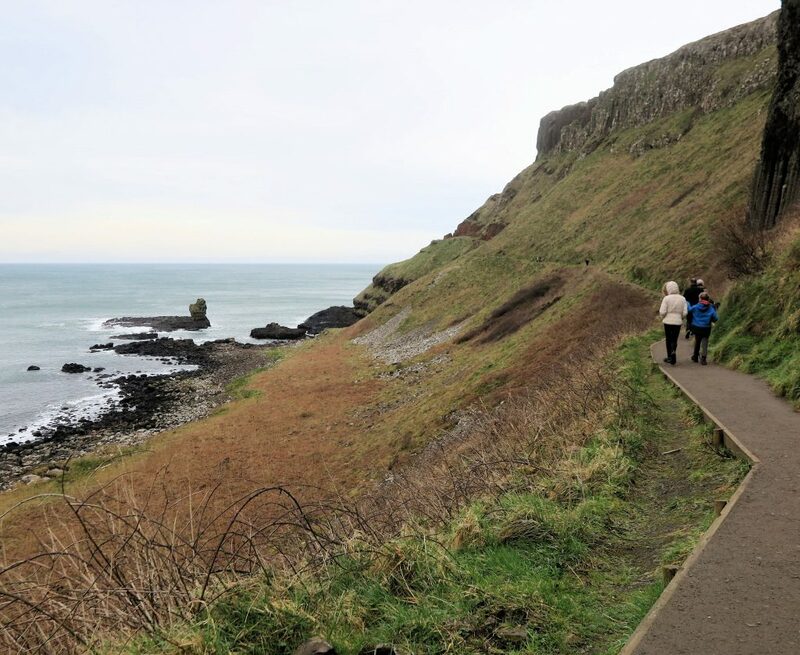 The path provides fantastic views of the Causeway Coast but it is sparsely fenced. It is not buggy friendly and you will need to keep hold of young children due to the narrow path and steep drop. Alternatively, turn left at the bottom of the steps for a short walk to the famous geometric causeway rocks. We entered via the blue route, walked the entire red trail and left by the red trail cliff top creating a spectacular circular walk. The Giants Causeway Visitors Centre is an impressive, modern, grass roofed building whose architecture was designed to reflect the iconic black, symmetrical rocks of the Causeway. Exhibits inside the centre chart the history of the area as well as explaining the geology, flora and fauna of the region. 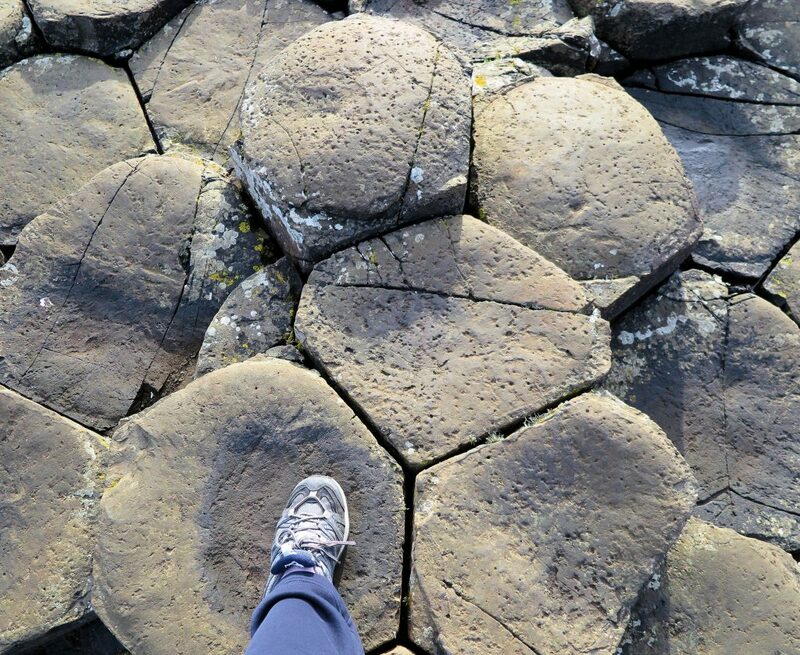 The exhibition also details how the famous geometric rocks of the Causeway were formed and the romantic story of their creation by the giant Finn McCool. The Visitors Centre is small but interesting and has the added bonus of a cafe and toilet. You must pay to enter the building but entrance fees contribute toward the upkeep of the Causeway. Entrance fees include the bus ride to and from the Causeway and an audio guide. We enjoyed the information and the stories on the audio guide but they were a little awkward for the children to wear and they kept getting entangled in them. We eventually removed them, packed them away and had one person relay the information to everyone else! Be prepared for windy weather! 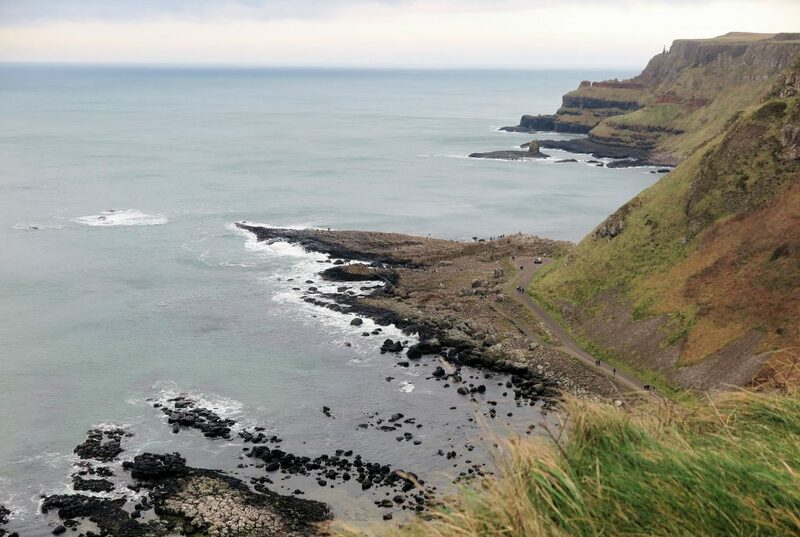 As outlined above, The Giants Causeway itself is free to enter. However, there is an argument to be made that as the Causeway sustains damage from the number of tourists that visit the Causeway every year, perhaps the tourists should contribute to its upkeep! 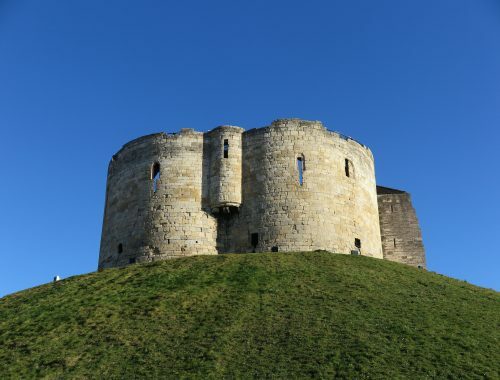 You pay to enter the Visitors Centre and its facilities, for parking and for the audio guide. The Visitors Centre is owned and managed by The National Trust so entry is free for members of the National Trust. 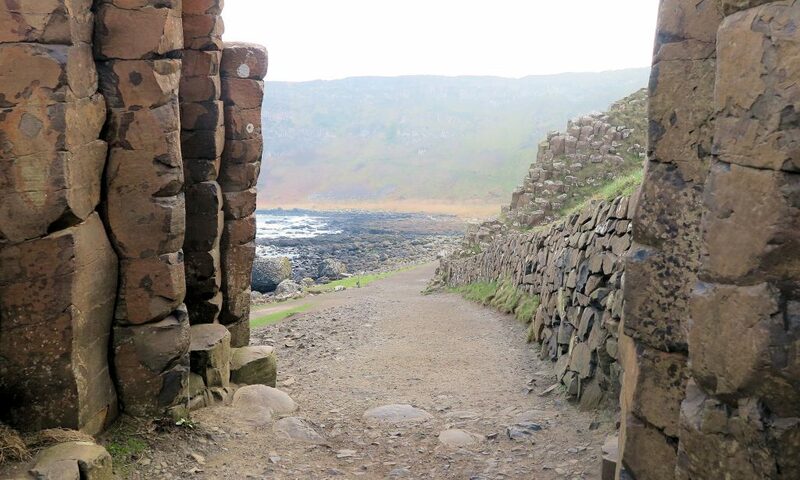 Current prices to enter the Giants Causeway are £12.50 for adults and £6.25 for children. The Causeway consists of two small promontories with a third, larger one in the middle stretching out into the turbulent Irish Sea. The rocks are strikingly unusual. Each one is a perfect geometric shape ‘slotted’ together like a giant mosiac. Some rocks are pentagons, others are hexagons or heptagons. The rocks vary in colour according to their proximity to the sea. Land based rocks are a creamy mocha brown with patches of algae and lichen. The rocks gradually get darker in colour the closer they are to the sea. Wave pounded rocks are a rich, jet black and appear shiny from the water. Stand looking out to sea and the rocks stretch out infront of you gradually sloping downward into the sea. It creates an eerie impression of a submerged path. It is easy to see how the legend of the Causeway construction arose! 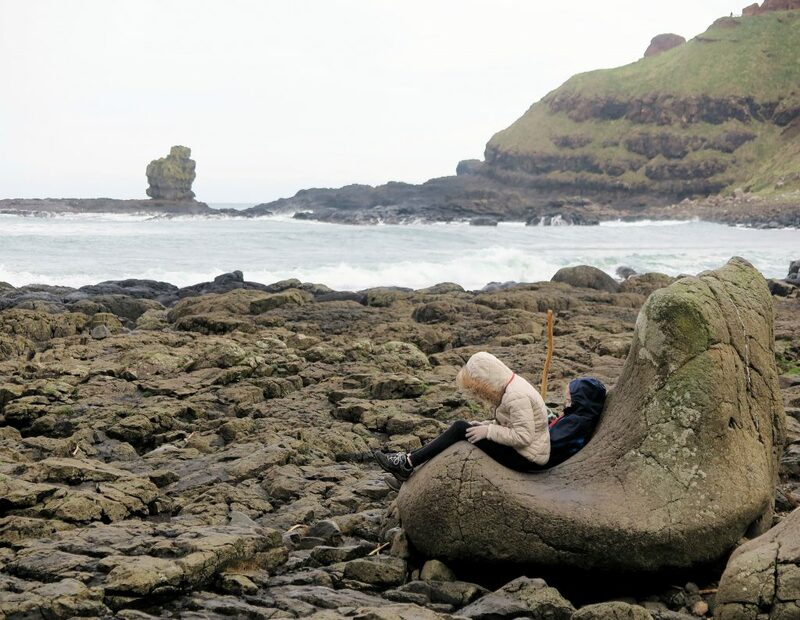 After exploring the Causeway rocks, head further around the coast to find ‘The Giants Boot’. This shoe shaped rock makes a ideal resting spot for kids! If it was a real boot, it would measure an enormous size 93 1/2 and be owned by a giant who was 100 metres tall! The Giants Boot make a perfect resting place! If possible, continue on the Red Trail to walk around the bay and climb the narrow stony path to ‘The Organ Pipes’. These are huge, impossibly uniformed geometric columns set into the hill. Continue further on the Red Trail to round the headland for a closer view of the Giants Chimney; a free standing tower of rock an incredible 100 metres tall! 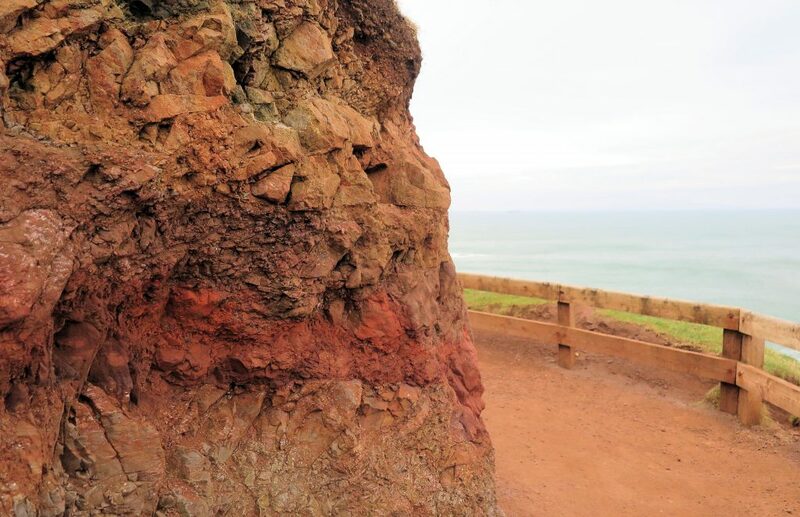 The vibrant red rock found here, laterite, stands in stark contrast to the black rocks of the Causeway. The path ends shortly after the rounding the headland due to a rockslide. There are lots of nesting falmers on the cliff faces, remember to bring your binoculars! On a cloudy overcast day, the towering cliffs, the jagged rocks and the raging sea create a moody, atmospheric environment. On a sunny day, the iconic Causeway rocks are more defined and deepen in colour. The colour contrast of the blue sea, green grass, black rocks and rich red laterite seams is breathtaking. You will take hundreds of photographs! I would recommend visiting the Causeway on different days and at different times of the day to witness the stunning changes to the Causeway caused by the changing light. Don’t rush your visit. Explore. Seek out quieter spots and allow yourself time to sit and watch the waves crashing on this ancient site. I would recommend parking at the Causeway rather than walking from Bushmills. Save those little legs for exploring the Causeway itself! Walking the Blue Trail is the easiest route for small children. The Red Trail is more challenging and is not buggy friendly. Beware of its steep drops and unfenced paths. The Causeway itself is not buggy friendly so leave your buggy at the edge of the rocks. The rocks are very slippery in places and can be wobbly. Wear sturdy shoes with good gripping soles. You can climb all over the rocks and there are marhsalls on site to help in case of accidents or injury. Do not get too close to the crashing waves. The waves are very strong and powerful and the rocks at the waters edge are dangerously slippy. Go as early as you can. 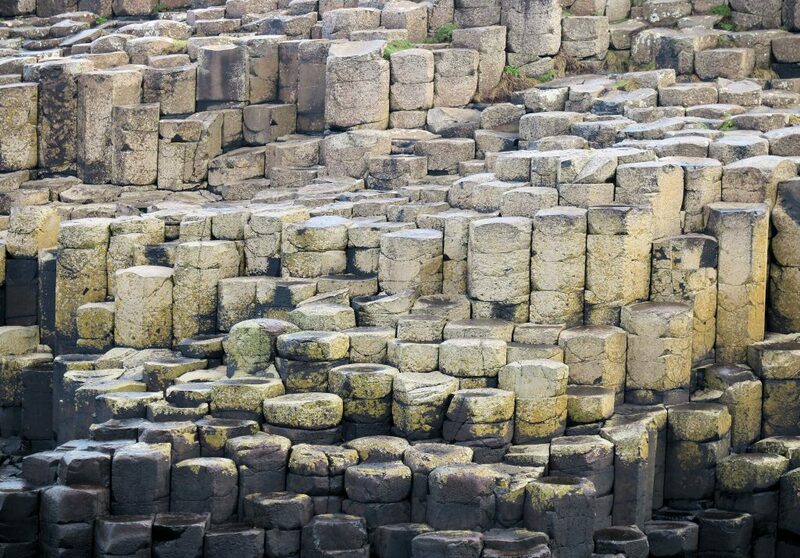 The Giants Causeway is busy all year round. We visited mid week in February, arriving each day by 9 o’clock in the morning. The Causeway was deserted and we enjoyed this spectacular place in peace. When we left around midday, the rocks were very busy with people. 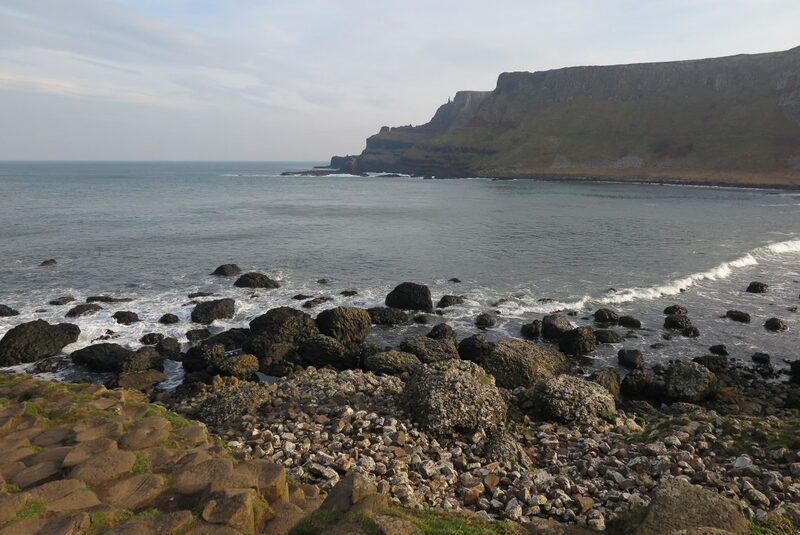 The Causeway Coast driving route spans the coastal road from Belfast to the north Antrim coast. If you are self driving from Belfast to the Giants Causeway, you should try to drive the Causeway Coast route at least one way. 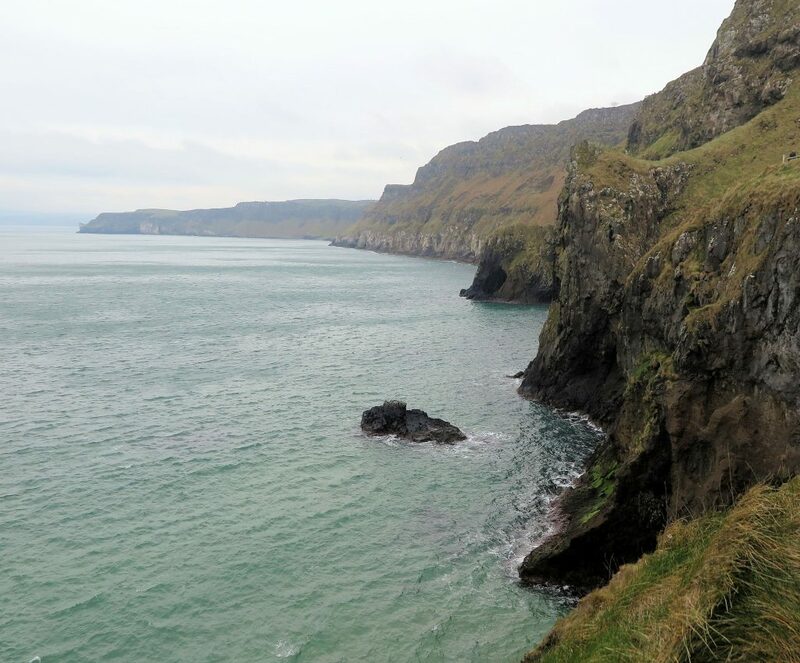 The northern Antrim coast is a breathakingly scenic drive. Winding roads hug the coastline offering jaw dropping views of the cliffs and Irish Sea. In contrast, the east coast road hugs the bottom of the cliffs, adjacent to the waves crashing on the shore. Along this stretch of the coastline you will pass pretty, working harbours and images of small town Northern Ireland. There are lots of things to see along along the Antrim Causeway coast. The Carrick a Rede Rope Bridge is sometimes (erroneously) called The Giants Causeway Rope Bridge – even though it is nowhere near the Causeway! 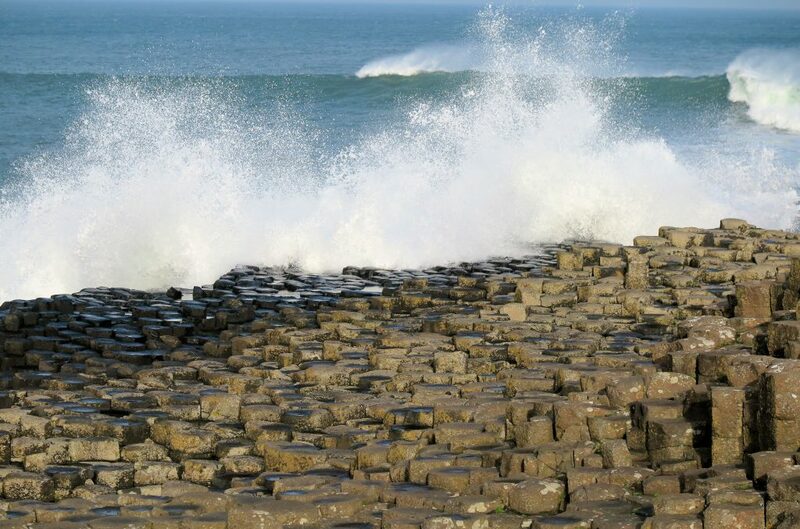 It is a twenty minute drive from the iconic rocks of The Giants Causeway. There is a free car park and though there is a ticket booth at the start of the clifftop path, it is free to enter to walk the scenic path to the bridge. This is a beautiful, easy walk especially on a sunny day. There are several steps on the way but otherwise it is doable with a buggy. If you want to cross the bridge you must buy a ticket from the ticket booth. Attendants at the bridge will check your ticket before allowing you to cross. The small bridge is an impressive feat of engineering. The bridge is 100 feet high and spans a 60 foot gap to the island of Carrick A Rede. It was erected by fisherman who used it to cross to the island to check on their salmon nets and originally consisted of just a single hand rope! 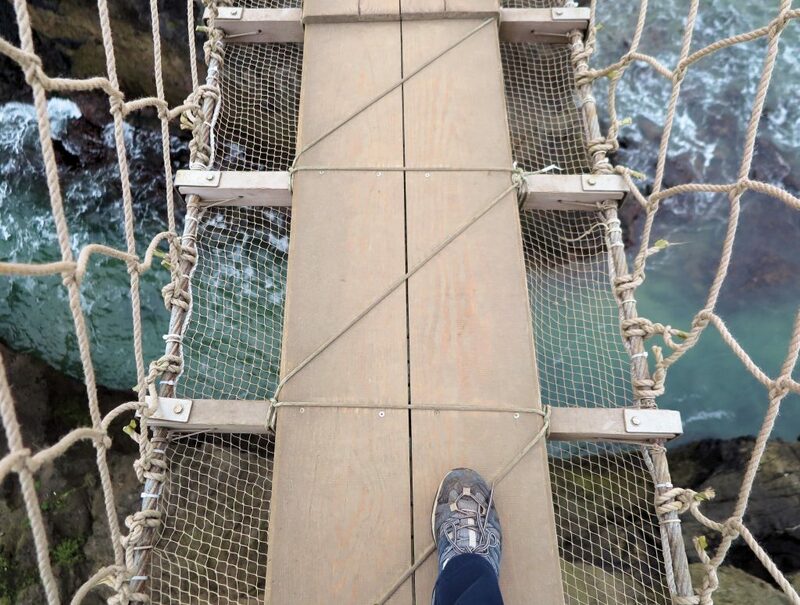 By crossing the bridge, you are actually crossing the mouth of the ancient Carrick A Rede volcano! The wooden plank and rope bridge is easy and sturdy to walk on. It takes just seconds to walk across it. The bridge sways and bounces a little and is closed to the public in very high winds. Due to its exposed position high above the sea and its open construction, crossing the bridge not be to everyones tastes! It is a thrill to cross the bridge, especially for children, but it is very short. Furthermore, most of the tiny Carrick A Rede island is closed so there is nowhere to go once you have crossed the bridge. 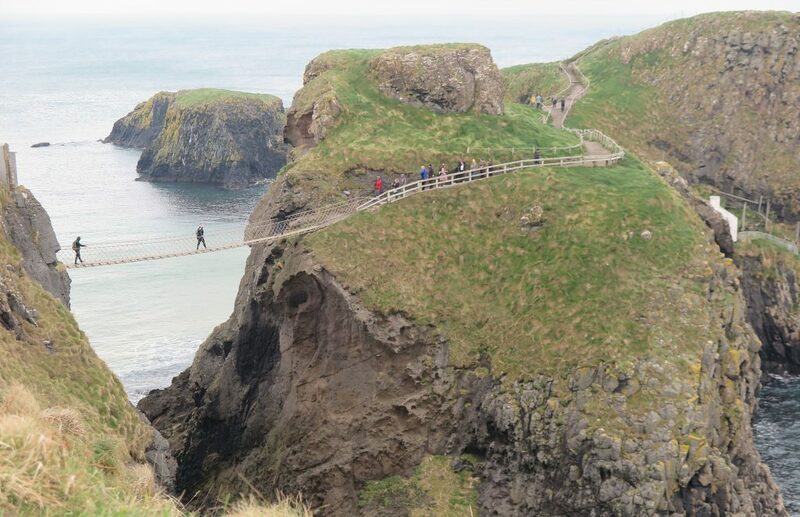 I would recommend visiting the rope bridge is you have time, want a scenic cliff walk or for a bit of fun for kids but I don’t think it should be the priorty of a visit to Antrim. 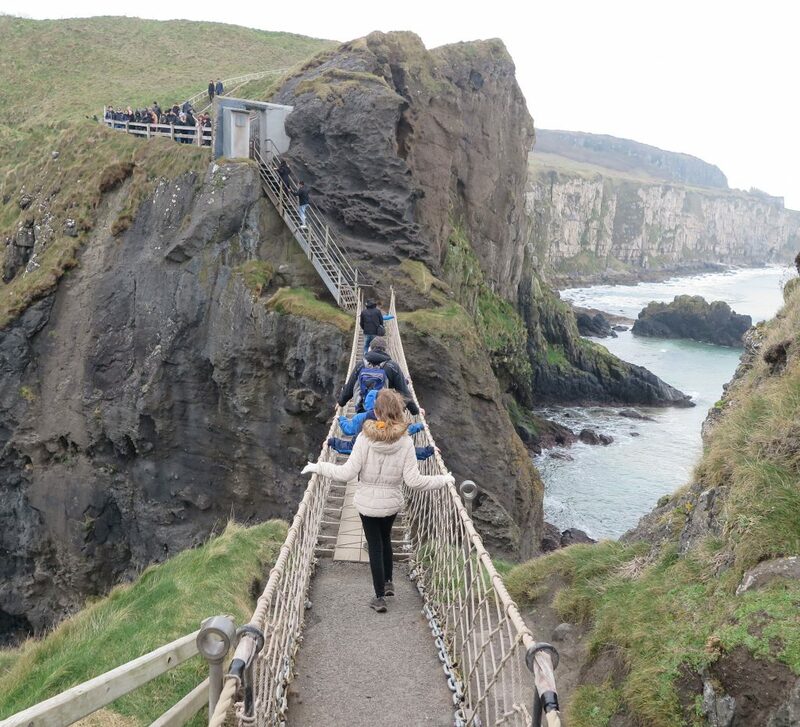 I’m not sure we would have paid the family ticket price of £22 to cross Carrick A Rede rope bridge if it wasn’t included in our National Trust membership. The Antrim coast is lined with beaches that on first sight will make you want to park your car and jump out! Visit picture perfect Mussenden Temple at the 11 kilometre long Downhill Strand. Games of Thrones fans will recognise Ballintoy Harbour Beach. Enjoy a bike ride along the promenade at West Strand Beach. 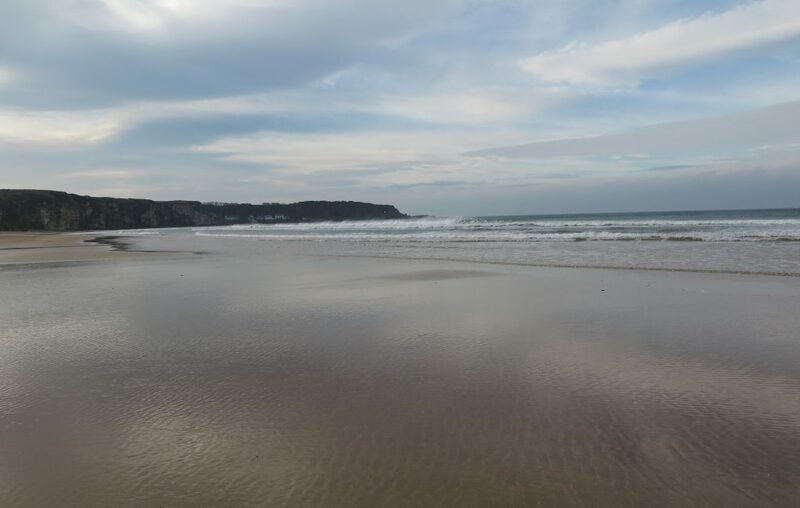 We loved the enormous expanse of pristine sand at Whitepark Bay. 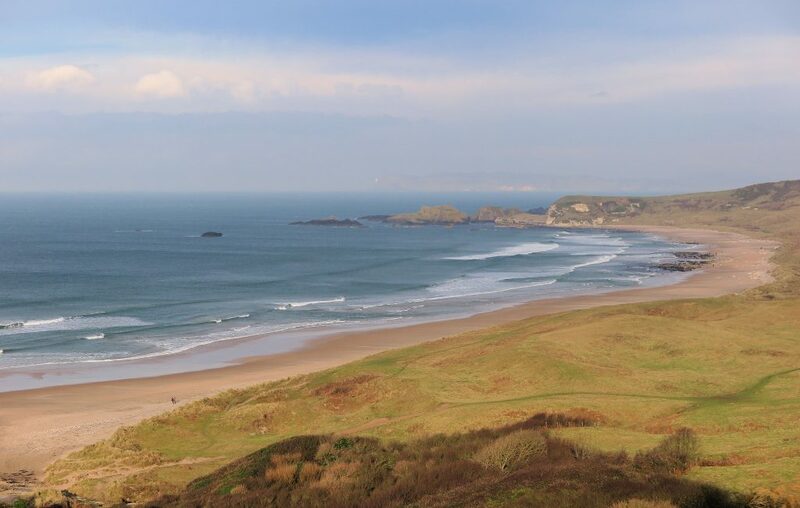 A short stroll downhill to the beach and the ancient sand dune, this beach is ideal for running off excess energy that kids cannot run off at The Giants Causeway! We spent more time here than we expected – it was empty, windswept and beautiful. 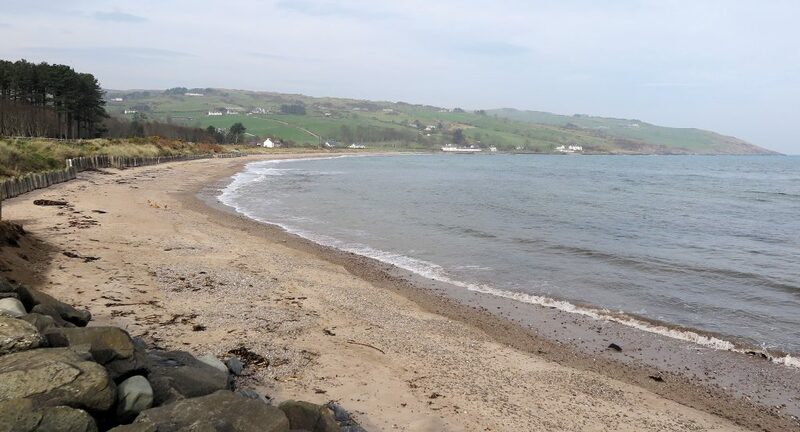 On the east coast stretch of the Causeway Coast route, about halfway towards Belfast are the pretty, quaint coastal towns of Cushendall and Cushenden. Cushenden is a very pretty, conservation village known for its unique, sloping style mansard roofed houses. Cushenden beach is small but clean and ideal for beach combing for shells and sea glass. Dunluce Castle ruins are a short drive from Bushmills. They a picture perfect set of medieval ruins on a basalt clifftop overlooking the sea. For the best views, head down the short path to the adjacent cove. Unfortunately when we visited, the path was closed! Once the seat of the Earl of Antrim, the extensive ruins are a popular stop on Games Of Thrones tours. The ruins are open to the weather and take less than an hour to fully explore. Entry is by ticket only. A family ticket is currently £15. 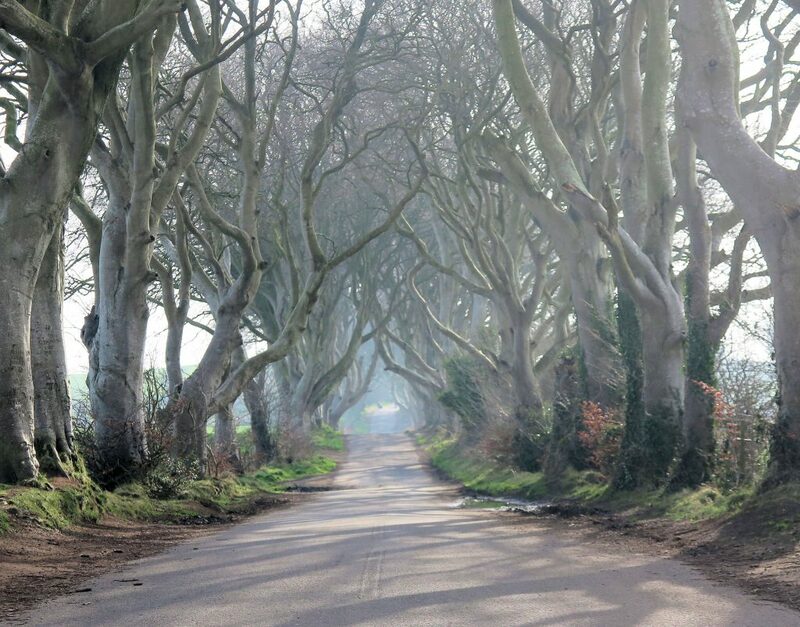 Another popular stop for Games of Thrones fans are the Dark Hedges on Bregagh Road near Armoy. A short, easy drive from Bushmills brings you to this 1 kilometre single lane road lined with beech trees which were planted in the eighteenth century. Park for free across the road at the Dark Hedges Hotel. I am not a Games Of Thrones fan but I love trees and on a crisp winter morning, it was very pleasant to wander up and down the lane. and we were driving past anyway! However, our children were less enthused! Tourists are asked not to drive down the lane or park on it as the trees were getting damaged due to eager tourists. Local and through traffic is allowed so keep an eye on free running kids! 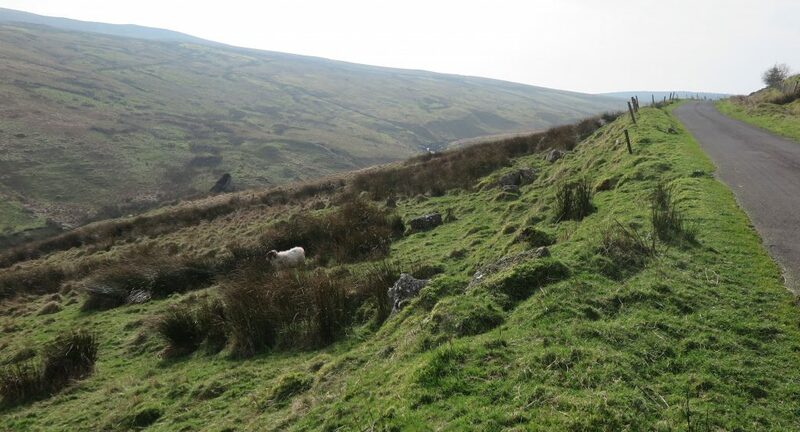 There are several detours off the coastal route that enable you to drive through one of the famous Glens of Antrim. We took one of these detours on a whim and it was incredibly scenic. The rolling landscape is a myriad of colours and very different to the dramatic, rocky coastline. 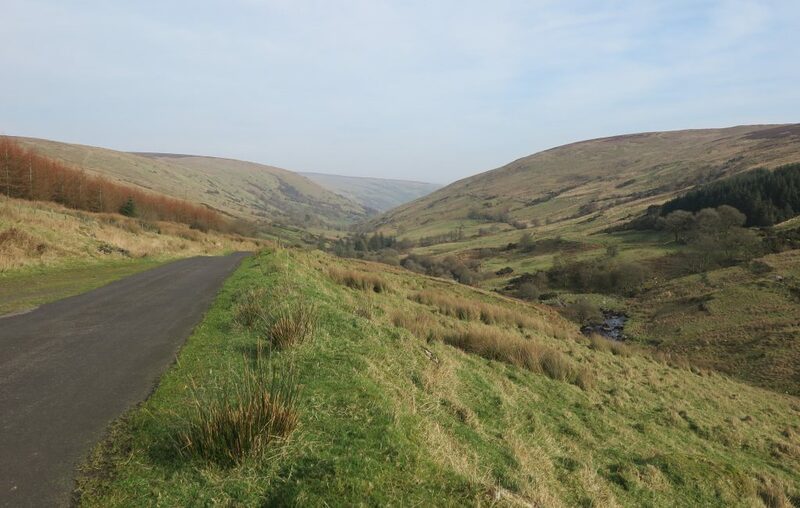 We drove through stunning Glendun on a winding, single lane tarmac road. We didn’t meet or see another person on the entire route. 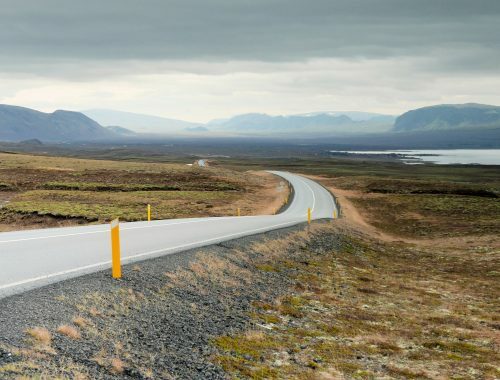 Stop your car and stretch your legs on one of the few marked trails. The views and the silence will be worth it! For more structured walking suitable for all ages, visit the lovely Glenariff Forest Park with its pretty three miles long, scenic waterfall walkway. 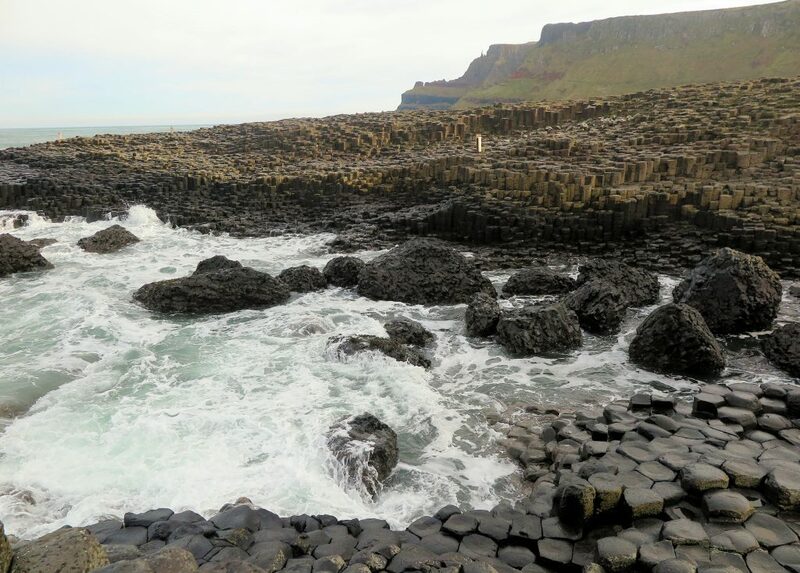 The Giants Causeway is an easy day trip from Belfast. On a direct driving route, it will take around 1 1/2 hours. It is doable in a one day self driving trip but Antrim deserves more than that! There are several day tours on offer from Belfast. Most include The Giants Causeway, Carrick A Rede rope bridge and The Dark Hedges. Tours start from as little as 25 Euros. 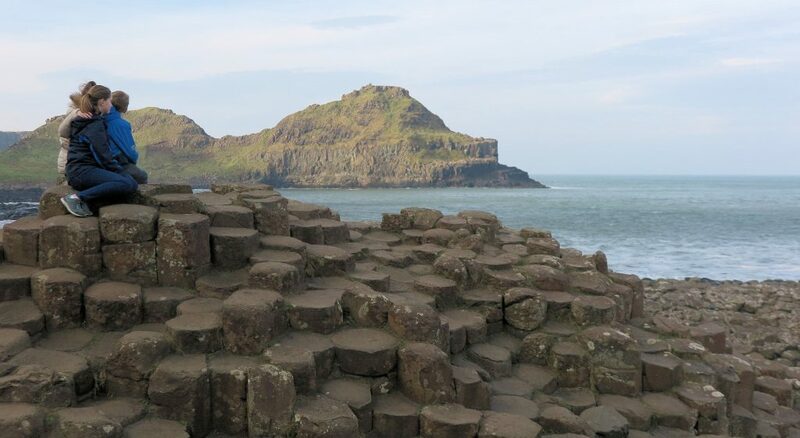 It is also possible to do day tours from Dublin to The Giants Causeway. Alternatively, catch a public bus from Belfast to Bushmills and take a taxi or walk to the causeway. There are Bed and Breakfast accommodations, small hotels and holiday cottages throughout Antrim offering family rooms. The Causeway Hotel is next to The Giants Causeway Visitors Centre – you cannot get any closer to the causeway than this hotel! We stayed in an Airbnb in Dervock, a short fifteen minute drive from the causeway. It is one of the best Airbnb’s we have ever stayed in! Spacious, beautifully decorated, quiet and spotlessy clean. Rosemary had added really thoughful touches such as hot chocolate for the kids and electric blankets! We loved our visit to Northern Ireland but it only made us realise how much more there is to do in Northern Ireland with kids. It is such a short distance from home that we will definitely return one day. Have you visited Northern Ireland with kids? What were your favourite things to do?